I have a huge weakness for markets and my favourite has to be the Byron Bay Markets, held on the first Sunday of every month. The atmosphere is great, the food is fabulous and the stalls offer amazing variety and quality. Located at the Butler Street Reserve (turn right at the very first roundabout just as you enter town), the markets are a busy clash of families, tourists, and the few remaining infamous hippies. A friend and I arrived early in the morning to eat breakfast. There are two food sections, one strip to your left as you enter (if you use the main entrance) and one in the North-West corner. Both offer a range of cuisines, and it is all fantastic. Choosing what to eat will be the hardest decision you make all day. I began my day with a Falafel Plate from the Orgasmic Falafel stand. I always get something from here, and I have to admit I was a little disappointed in the plate. I do however, highly recommend the Falafel Pocket; I've had that many times before and it has always been absolutely delicious. Following we got coffee and stuffed, chocolate-covered figs from Oasis. I am not usually a fan of figs, but the stuffing itself was amazing. We then ordered a piece of Chocolate and Avocado Tart from the raw food stand where they were also advertising 'free hugs'. I'm not sure it was the tastiest thing I've ever tried, certainly if I was in the mood for a real chocolate fix that would not be my choice, but it did feel healthier than getting stuck into a piece of Devil's Food Cake. Once my friend had insisted on collecting his free hug we continued on, strolling through the endless rows of stalls tasting dips and dukkah, trying organic locally-made lotions and browsing second-hand bookstalls. In an attempt to relive my childhood I had a Honey Stick which are a great treat for honey lovers and kids alike, and only 25 cents. After a lap of all the stalls we had worked up an appetite (or maybe we were just provoked into greediness by the aromatic smells) and decided it was time for lunch. This time we went to the corner food court, where we both had a sausage from the Gourmet Sausage Hut. I chose the lamb and mint sausage – it was amazing. If you decide to get a sausage I'm sure any of the flavours are winners, but I highly recommend that when you are choosing your sauce you steer clear of the boring tomato and barbeque options; go for their special home-made sauce which is a sweet, chunky tomato creation. Incredibly tasty, and goes perfectly with the grilled onions. While eating our sausages we enjoyed live music from the many local performers and watched the parade of people pass by. After this we got a jacket potato with a twist; you could choose between a normal potato and a sweet potato. We chose the sweet potato which was again, delicious. We topped it all off with an ice cream from a great little stall. You choose your flavour (strawberry, banana or strawberry and banana), they then put the fruit itself through their magic machine, in which the fruit is mixed with ice cream to create a naturally flavoured treat. This is some of the best ice cream I've ever had so I definitely recommend trying that. After deciding on which items on which items we wanted to buy from our initial stroll through, we returned to these stalls and emptied our wallets a little. By this time we were quite exhausted and ready to call it a day, so we headed to the beach for a swim. I'm not sure day trips get any better than that. One activity I didn't get around to this time but is great for kids is candle making. This stall offers children from 0-100 the opportunity to make their own candle, after which it is moulded into a shape of their choice. Simply purchase your wick and dip it (many times over) in the huge range of coloured wax until it is thick enough to mould – the sharp-eyed stall owners have been doing this for years so they'll let you know. The child can ask for a particular shape or be inspired by the display on offer. 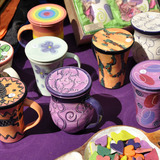 The stall-owners will cut off the ends of the candle, revealing the multicoloured circles within, and use those to create the work of art. Examples of shapes on offer include a car, flower or more abstract designs. Entry is free but each month there is a local charity chosen which collects at the entry, so a small donation is appreciated. Dogs are not allowed.